What's better than getting together with friends and neighbors for a good old fashioned block party? Getting together for a good old fashioned Jackpot Block Party of course! Get ready party people, put on your party hat and enter the party zone where big prizes are awarded in this wonderful 30-payline slots from WMS slots! What’s better than getting together with friends and neighbors for a good old fashioned block party? Getting together for a good old fashioned Jackpot Block Party of course! Get ready party people, put on your party hat and enter the party zone where big prizes are awarded in this wonderful 30-payline slots from WMS slots! With the success of Super Jackpot Party slot, it seems only fitting that WMS would throw another bash and they sure did with this game. Jackpot Block Party slot has a 70’s flair to it just like the other game, but this one is a bit different. You’ll hear 70’s disco music in the background and see symbols on the reels like a piece of cake, lava lamp, nacho cheese dip, the Party Zone sign, disco ball, party blowers, Jackpot Party logo, gifts and 7’s. 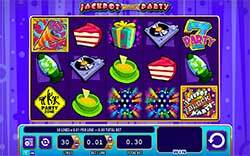 Jackpot Block Party Wilds – The Jackpot Block Party logo is the wild symbol in this game and will substitute to complete winning combinations when possible for all symbols except the three party noise maker feature symbols. Pick’em Present Feature – Just like the other WMS party game, this one has a Pick’em Present Feature as well that will award instant cash prizes. To trigger this bonus you’ll need to get 3, 4 or 5 gift wrapped boxes on the reels. Unlike the present feature in the other game, in this one the three gifts remain on the reels and you’ll simply have to pick one of those to reveal your winnings! Block Party Feature – There are three noise-making party symbols that will be your invitation to the Block Party if you land three of the same on reels 1, 3 and 5 simultaneously. If you manage to trigger the Bonus Feature, you’ll get to choose which party you’d like to attend from either the Office Party, Player’s Party, Costume Party or VIP Party. At each respective party, you’ll keep selecting gifts to open to reveal instant cash prizes until the unsightly entrance of the Party Pooper or Buzz Kill!